Violín is centered about 30 km southwest of Chilpancingo de los Bravos, the state capital of Guerrero, Mexico (99º18’W, 17º20’ N; 1:50 000 map sheets E14C38 and 39). The Property consists of 2 concessions owned 100% by Minera GS S.A. de C.V. that overlap a total surface area of 4127.4 Ha. The nearest producing gold mine is Goldcorp’s Los Filos mine, an open-pit, heap-leach operation located about 80 km north northwest of the Violín Property (www.goldcorp.com). About 12 km northwest of Los Filos, Torex Gold’s El Limon-Guajes (ELG) open-pit Project recently started production. In June of 2015, they reported mineral reserves of 3.6 million ounces of gold with grades of 2.62 g/t Au and all-in sustaining costs (ASIC) of $616 USD/oz. Between ELG and Los Filos, Torex is developing a second deposit called Media Luna that has an inferred resource of 7.4 million Au Eq. oz (www.torexgold.com). Finally, about 25 km northwest of Los Filos, Timmins Gold is developing the Ana Paula deposit. Ana Paula has measured and indicated reserves of 41 million tonnes of 1.410 g/t Au and 5.37 g/t Ag, or 1,859,000 contained ounces of gold and 7,076,000 ounces of silver (www.timminsgold.com). Collectively, these mines define a northwest trending belt informally referred to as the “Guerrero Gold Belt” (GGB). At Violín, copper and gold in potentially economic concentrations occurs in magnetite disseminations, stockworks and pods hosted in Paleocene QFP intrusions that outcrop just north of Coaxtlahuacan. Geological models imply that the QFP may be a part of a northerly dipping (plunging) sediment sill complex about 1000 m thick where QFP intrudes and inflates marine strata of Middle Jurassic to Middle Cretaceous age. Limestone occurs in the Middle Jurassic Tecocoyunca Group, and more abundantly in the Early Cretaceous Zicapa Formation and overlying Middle Cretaceous Morelos Formation. Limestone is a particularly receptive host rock that alters to magnetite in the presence of oxidizing, sulfur-poor magmatic-hydrothermal fluid. In the Paleocene, southwestern Mexico was part of extensional arc tract MX-T3 that includes known porphyry copper deposits Tepal, Inguarán, La Verde, and San Isidro (Hammarstom et al., 2010) as well as magmatic hydrothermal iron oxide copper gold (MH-IOCG) deposits Mezcala and Mochitlán (Violín). Differences between these otherwise quite similar deposit types might be explained primarily by a difference in magmatic sulfur content. Specifically, fluids exsolved from hydrous but sulfate-poor magmas precipitate the bulk of transported Fe as oxide phases, with minor (but potentially economically important) Cu ± Au-rich sulfide phases and more restricted development of late-stage acidic alteration styles (Richards and Mumin, 2013). 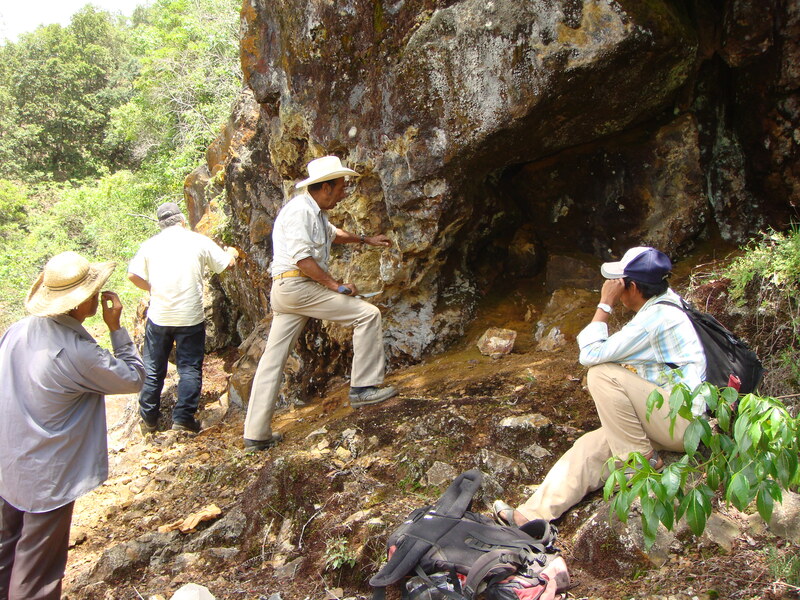 Lead, zinc and silver with subordinate copper and gold occur at Guadalupe, Espinazo, La Fortuna and Tres Amigos. Some of these prospects appear to be veins, whereas others may be sulfide-rich (rather than oxide-rich) metasomatic zones (replacing limestone?) marginal to the Paleocene intrusions. A Budget of about $1,050,000 USD is proposed to complete: (i) about 4000 m of drill testing, (ii) 700 line kilometers of helicopter airborne geophysics, and (iii) geological mapping. Minera GS is privately owned and is actively seeking a partner to fund the next stage of exploration. Click here for a Project summary. Please contact us for further information. Hammarstrom, J., Robinson, G., Ludington, S., Gray, F., Drenth, B, Cendejas-Cruz, F., Espinosa E., Pérez-Segura, E.,Valencia-Moreno, M., Rodríguez-Castañeda, J., Vásquez-Mendoza, R., and Zürcher L., 2010, Porphyry Copper Assessment of Mexico, USGS Scientific Investigations Report 2010-5090-A, 192 p.